Shortly after Brody turned 3, he finally learned how to climb in and out of his crib. That's about when I feel it's time to get a big boy bed. Trust me, I am all for keeping kids in little prisons - I mean cribs - for as long as I can! Brody was a big fan of shopping for his mattress. He had to test out just about every bed. In the end, we went right back to where we bought Autumn's mattress and bought the exact same one. Easy peasy. 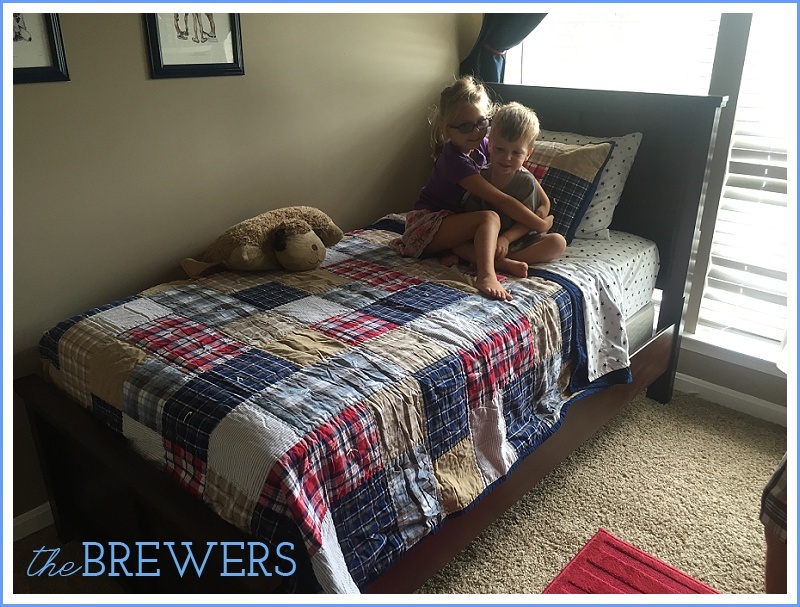 Adam's parents offered buy Brody's first bed and mattress set as a gift. I found one online that was just what I was looking for and a few short days later, it arrived! I had picked out the bedspread and sheets at least a year or two ago, and was so happy when I found it all on sale! Adam and I put the bed together and once we decided on a layout for his room, I dressed his bed and readied the room for the big reveal. He loved it! Even after he'd seen it and checked it out, I found him in his room reading on his new bed, plucking books off the shelf each time he finished one. Of course when a toddler gets a new bed, the worry is will they stay in their room? Are they going to run out when they don't want to go to bed? I am happy to report that Brody has been a dream. Not once has he ever gotten out of bed when we've put him into it, even when he is unhappy to be calling it a night. The transition could not have been more painless!